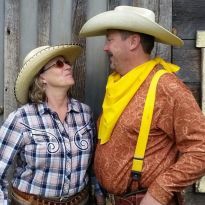 Wade and Teresa are a Husband and Wife team competing Nationally in the sport of Cowboy Action Shooting. Along with their many Awards and Championship buckles they have also earned the respect of fellow competitors. I may be biased, but these two are some pretty neat folks! To win so many shooting competitions so consistently is amazing! 10 out of 10 would recommend.